Ward, Lynd (1952). The biggest bear. Houghton Mifflin Co. OCLC 473942487. Forbes, Esther (1943). Johnny Tremain : a novel for old & young. Houghton Mifflin Co.
Ward, Lynd (1929). 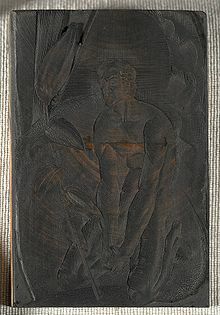 God's man : a novel in woodcuts (2 ed.). Jonathan Cape and Harrison Smith. OCLC 963862969. Ward, Lynd (1930). Madman's drum. Harrison Smith. OCLC 2928334. "Prelude to a million years" の解説 Ward, Lynd (1933). Prelude to a million years : a book of wood engravings. OCLC 6241242. Ward, Lynd (1937). Vertigo. Random House. OCLC 58885407. Ward, Lynd (1959). Bible readings for boys and girls : selected passages from the Revised standard version of the Holy Bible. Thomas Nelson & Sons. OCLC 1648764. Ward, Lynd (1965). Nic of the woods. Houghton Mifflin. OCLC 836726601. Ward, Lynd (1973). The silver pony : a story in pictures. Houghton Mifflin. OCLC 593454. Ward, Lynd (1974). Storyteller without words : the wood engravings of Lynd Ward. Harry N. Abrams, Inc. OCLC 983638. 『Gods' man』以下3作をまとめた出版物 Ward, Lynd. Gods' man : Madman's drum ; Wild pilgrimage. ウォードのエッセーと「文字のない小説」をふくむ作品集。6分冊 Ward, Lynd (2010). Spiegelman, Art. ed. Lynd Ward: Six Novels in Woodcuts (boxed set). ライブラリー・オブ・アメリカ. ISBN 978-1-59853-082-7. 妻メイ・マクニアーの小説（ちびの皇子—勇者義経と忠実な騎士西塔の弁慶の冒険） McNeer, May (1929). Prince Bantam: being the adventures of Yoshitsune the brave and his faithful henchman, great Benkei of the Western Pagoda. The Macmillan Company. OCLC 1861994. Coatsworth, Elizabeth (1958). The cat who went to heaven. The Macmillan Co.. OCLC 170961. "The cat who went to heaven" の挿絵の下書きほか完成するまでのスケッチをまとめた資料集 The cat who went to heaven : production material. (Archival material, 1950s). OCLC 62424393. Clark, Leonard (1961). The Rivers Ran East. A special ed. for young people. Funk&Wagnalls. OCLC 506253769. 1960年代始めの少年雑誌 Boy Scouts of America, ed. Boys' life. : the boy scouts magazine (G.S. Barton). OCLC 8497843. リトグラフの挿絵 Tresselt, Alvin (1971). Stories from the Bible. Coward, McCann & Geoghegan. 『児童書作家マーゲライト・ヘンリーの挿絵画家たち』に収載 Henry, Marguerite (1980). Dennis, Wesley. ed. “The Rivers Ran East”. The illustrated Marguerite Henry : with Wesley Dennis, Robert Lougheed, Lynd Ward, and Rich Rudish. OCLC 6709256. ^ Spiegelman, Art, ed (2010). “Chronology”. Lynd Ward: God's Man, Madman's Drum, Wild Pilgrimage. ライブラリー・オブ・アメリカ. pp. 799–833. ISBN 978-1-59853-080-3. ^ 映像作品。リンド・ウォードとメイ・マクニアーの伝記 Ward, Lynd; McNeer, May Yonge (1974). Office of Television Services. ed. Lynd Ward and May McNeer (映像). テンプル大学. ^ 2011年ウィル・アイズナー漫画業界賞公式サイトより。殿堂入り8名のうちグラフィック・ノベルの先駆者として選べれ、娘のロビン・ウォード=サビッジが表彰を受ける。 Spiegelman, Art, ed. Lynd Ward: Six Novels in Woodcuts. San Diego Comic Convention. http://www.comic-con.org/cci/cci_eisners_11nom.php#nominees 2017年1月2日閲覧。. デトロイト美術館所蔵のリンド・ウォード資料集 Ward, Lynd. [Lynd Ward : artist file] (資料集). OCLC 883970992. 大学で開かれた木版画展の図録 Willett, Perry (1997). The silent shout : Frans Masereel, Lynd Ward, and the novel in woodcuts. インディアナ大学ブルーミントン校. OCLC 36526265. 雑誌インタビュー Lynd Ward, Interview. (1976). 回顧展の図録 Ward, Lynd (1986-04-29). Lynd Ward, wood engravings 1929-1977 : a memorial exhibition, March 4-29, 1986. Associated American Artists. OCLC 15255496. 稀少本に関するシンポジウム論文集 Lynd Ward's last, unfinished, wordless novel. ラトガース大学. (2001). OCLC 48934243. ウォード三部作の解説 ライブラリー・オブ・アメリカ, ed (2010). Prelude to a million years ; Song without words ; Vertigo. Penguin Group (USA). OCLC 54859691.